Our politics has arrived at a point when we must insist on recognising the niceties of human nastiness. Organised horror in Parliament is either trivialised or ignored by most of mainstream media print and electronic. What unfolded in Parliament last week cannot be described as politically wrong, improper or even contemptible. None of those adjectives approach anywhere near truth. What continues to unfold in our Parliament has happened before in other parliaments in other times. So, we must not delude ourselves. We must identify it and describe it for what it is. What unfolds in our Legislature is pure political evil. While the methods of political evil are horrific, their goals are familiarly political. They are moral monsters elected by us. Just denouncing them as devilish or demonic is to allow them off lightly. They are all too human with arch inhuman qualities in their corrosive breasts. The leaders sporting maroon shawls benignly ignoring the chaos, when by a simple commend they could call off the hounds were and are equally evil. “At 2:20 p.m. when the side doors to the Chamber opened, about 30 Police officials entered in a human chain, forming a barricade around the Sergeant-at-Arms who held tight to the Mace, the symbol of an official session of Parliament. The Speaker walked in behind the Mace. JO MPs pelted the Police officers with chairs, thick bound books and threw water mixed with chillie powder at the wall of Police officers who were unmoved and never retaliated. Johnston Fernando led the charge. “Amidst the chaos, with Psecurity holding cushions over his head to prevent attacks from projectiles, the Speaker conducted a sitting from a makeshift bench on the aisle of the Chamber. His microphone worked, and the Hansard recorded all of it. Standing Orders were suspended by majority vote. “The no confidence motion against Prime Minister Rajapaksa passed on Wednesday was tabled again with its first clause deleted. The Speaker called for order, so he could take a vote by name. Since JO MPs did not heed him, he took a voice vote. ‘The Ayes have it,’ the motion was carried, the Speaker declared shortly before he adjourned the session till 19 November. Through all this the JO continued to hurl things at MPs, the Police and the Speaker. When a reporter asked Parliamentarian Keheliya Rambukwella about the chaos inside the Chamber, his wide-eyed response was, “What chaos?” That was Orwellian doublespeak at its best. This is pure evil. There is no other word to describe it. Throughout human history, there have been such aberrations when politics links up with evil. Practitioners of political evil are not insane although they commit insane acts. What makes perpetrators of political evil so scary is their rationality and their deliberate indifference to decency. They consider evil to be a legitimate political instrument to achieve their political goals. They are in effect do what terrorists do in unleashing violence. As political science scholar Alan Wolfe in his classic study of ‘Political Evil’ asserts ‘Political Evil’ comes with its own shock of recognition. 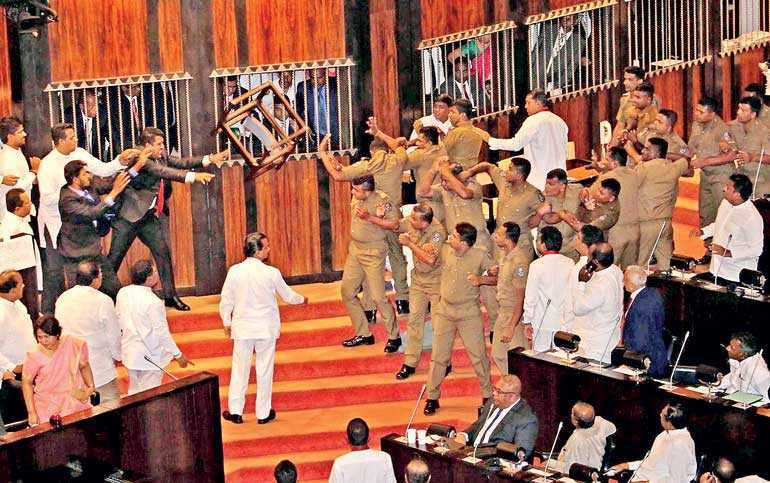 Thanks to digital technology, parliamentarians responsible for the pandemonium have been captured precisely and perfectly together with their individual contributions to the chaos, destruction and violence are readily and precisely available for the curious and concerned citizenry. It is not a purposeless excess. We must recognise its strategic purpose. It has a political character. Identifying its political character is the essential prerequisite to counter it and to defeat it. This is not about restoring the UNF administration or the premiership of Ranil Wickremesinghe. This is about fighting and defeating political evil. The JVP, the TNA and the Muslim minority parties have decided to close ranks with the UNF to counter what they have correctly identified as political evil. What is this evil? The JVP as a political minority, and other parties that are ethnic or religious minorities have recognised the transgressive nature of this political evil. The hijack of the Legislature is a break with common morality and established custom. It not only violates the law but thrives on its ability to cause havoc and create fear. Democratic politics are conducted according to rules and its practitioners are bound by law. We ignore these simple, absolute and manifest truths on ‘political evil’ at our own peril. In this hour of great political peril, only a fiendishly ferocious mind immune to democratic niceties would describe the TNA as a ‘bosom buddy,’ ‘hand in glove with the UNP’ or the Marxist JVP as a ‘close ally of the UNP’. Conflating the motives of political evil doers with our own biases and punditry is blatantly myopic and brazenly imbecilic. Such mischief to weaken the political alliance that is now in a do-or-die battle to salvage our parliamentary democracy must be condemned unequivocally. How does democracy collapse? How does autocracy begin? The common myth is that, it happens when people lose faith in democracy. That is not how it happens. It happens when political elites or what we call the political class polarise themselves and mistake the actions of a few rabble rousers and the cacophony they unleash as the entrenched preferences of the many. But that is nor what is happening today. The young girls smartly attired carrying placards declaring ‘we are here not for Ranil but for democracy’ is a phenomenon as real as the phenomenon of the metamorphosis that makes the caterpillar in to a butterfly. Only the diehard partisans support the ‘putschists’ while the vast mass of the population have refused to be stampeded in to supporting the power grab. Political polarisation that occurred on 8 January 2015 is very much in place. Post 26 October zeitgeist is different from that which allowed the ‘Pohottuwa’ performance in the Local Government election which essentially indicated the better mobilisation of the core of the Rajapaksa ‘royalisation’ project. There is now a less visible, private polarisation and a change in public opinion. The public revulsion of the events in parliament is obvious to all but the core conspirators and their immediate support base. The new discourse in social media has filled the vacuum created by the oligarch controlled mainstream media that has insistently attempted to maintain a façade of normalcy and business as usual. Social media has also energised civil society transforming it in to ill-defined but terribly credible social movements that will ultimately arbitrate in the process of public polarisation. Political parties can no longer command the uncritical mass base that they once held captive. Much has happened in the three years since 2015. Social media is a loud speaker for the masses to express dissent, frustration and anger. It is also a reluctant endorser and a grudging approver. Apathy of the masses was the common explanation for democratic failure in the 20th century. That is no longer the case today. The insistence on a general election under a caretaker government that has a demonstrated contempt for Parliamentary procedure is a naked admission of their intent to intimidate the electorate. The ordinary people must take the initiative in shaping their destiny in these extraordinary times.